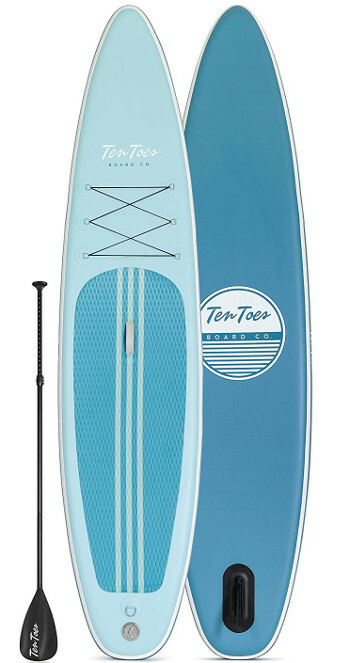 There has got to be a bigger brand than Ten Toes in the inflatable paddle board industry but up till now that brand hasn’t been named. Therefore, one can simply argue that Ten Toes SUP is probably the biggest paddle board manufacturer in the US and that is supported by a number of reasons. Indeed, Ten Toes is the creator of some of the most reputable boards on the market and that is based on strong pillars. 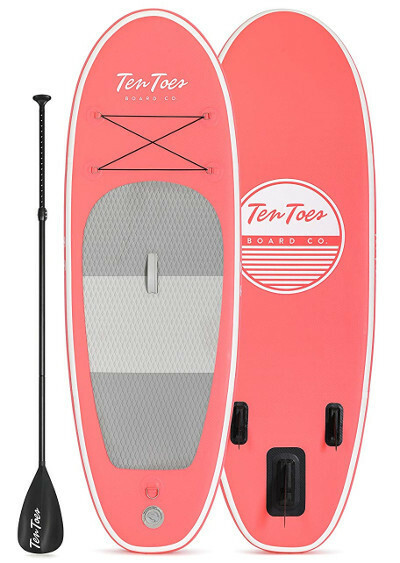 Beyond design and quality, Ten Toes aims at establishing a connection with these boards, giving them an identity and allowing you to experience paddle boarding in your own way. The Weekender is one of the Ten Toes’ most versatile boards, which means that it’s developed to mimic the profile of most paddlers or those interested in paddling. If you’re wondering how that is possible then you ought to take a closer look at the Weekender. First things first, the versatility of the board relies greatly on its ability to handle paddlers of various sizes. Accordingly, the Weekender measures a fulfilling 10 feet in length, which is the perfect fit for young adult, adult, and even maturing teenagers. As for stability, the Weekender plays it safe with a solid 30 inches in width which will strongly influence the paddler’s balance positively. Last but not least, Ten Toes did not neglect thickness as it is a critical dimension for multiple reasons and went ahead with a sweeping 6 inches to enhance the rigidity and weight capacity of the board. PS: Weight capacity can be maxed at 250 pounds. The greatness of the board lies in the details and one closer inspection of the board can tell you just how much time and effort were dedicated in the making of the Weekender. However, one aspect, which clearly exhibits the outcome of this process, are the vital parts of the board. From the slick edges to the wide nose and tail, the Weekender is obviously not a racer but a perfect entry-level board. So, if you’re trying to get into the sport then this is your best option. 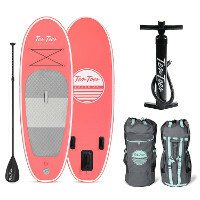 The cherry on top of the cake for paddle boards has got to be a proper package and Ten Toes is perhaps the father of cherries since it hooks most of its boards with complete packages. Accordingly, the Weekender is no exception as it comes with a basic package which includes pretty much all you’ll need to keep this board up and going. 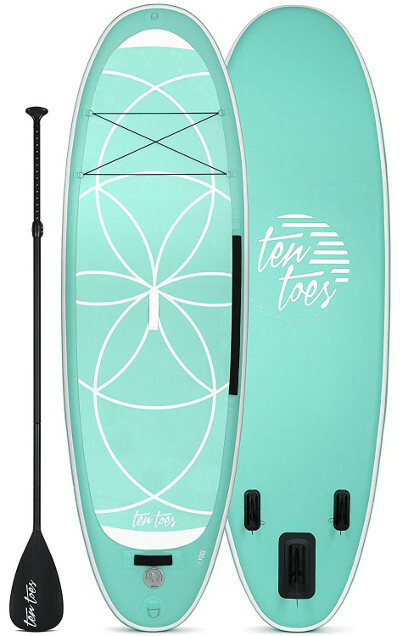 The Ten Toes Nano is definitely a fresh perspective on paddle boarding as it is designed primarily for junior paddlers. In that respect, it must be acknowledged that Ten Toes is not a pioneer for junior boards but it’s definitely taking the lead in numbers. Accordingly, the Nano is a compact fun board with the same character of the bigger Ten Toes. This goes to show that the board at hand is actually not downgrading on anything else but the size. Hence, the Nano measures a proper 8 feet in length, making it perfect for all kids / teenagers below 120 pounds. Nonetheless, although quite smaller, the board doesn’t sacrifice width as it remains true to the 30 inches checkpoint that ensures superior stability and balance for the paddler. Finally, to wrap this up, the Nano goes for a reasonable 4 inches in thickness, which double downs on the strength of this little board. Now that size is out of the way and you are certain that this is the board you want, perhaps you want to learn a little more about why this is the best board for you or your kids. The Nano is definitely tough which means that it’s not going to be easily handled, right? Wrong! Actually, the Nano is design to be as steady as possible but also as responsive as the triple fin navigation system can be. Further, the board features a slim hull with smooth edges and round ample ends with the purpose of remaining as stable as possible under all circumstances. 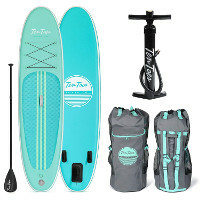 To wrap things up, literally, Ten Toes usually makes sure that the paddler receives everything they’ll need to maintain their boards but because it is smaller, the brand decided that the Nano doesn’t really need a bag pack which is the only thing lacking this package. The board can be reduced to a really small roll but a back pack would have been much appreciated, considering the price of this board. 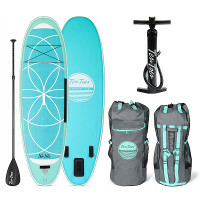 The Globetrotter is a unique stand up paddle board which ranks Ten Toes at the top of the charts as the most audience oriented brand. Indeed, the board at hand is specifically developed for a certain category of paddlers that is generally fond of longer trips. Hence, the Globetrotter, as the name indicates, is a touring board with the heart of a racing one since it features a lot of great little specs within a reasonable price range. The Globetrotter thus measures an astounding 12 feet in length which is essential for longer tours and perfect for adult paddlers. Also, to ensure that a board this long will remain balanced, the brand went for a generic 30 inches in width which creates more than enough stability for the paddler. Lastly, the Globetrotter measures a sturdy 6 inches in thickness, making it more robust than any other touring board on the market. PS: the board is capable of handling up to 250 pounds as a maximum load. In order to manage the gigantic hull, Ten Toes blessed the Globetrotter with modern engineering and technology to make it as easy to handle as a normal sized board. Accordingly, the board is developed with smooth edges, sharper ends and a single fin to maneuver as easily as possible. 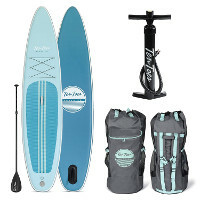 Eventually, in an attempt to make the Globetrotter a market leader, the brand makes sure that every one of these boards is shipped within a complete package that contains everything you’ll need to enjoy your long tours and facilitates your drives back home with this inflatable giant. If you’re a Yoga enthusiast, then this iSUP board is for you. This board is actually designed specifically for people who are looking to combine yoga with water sports. 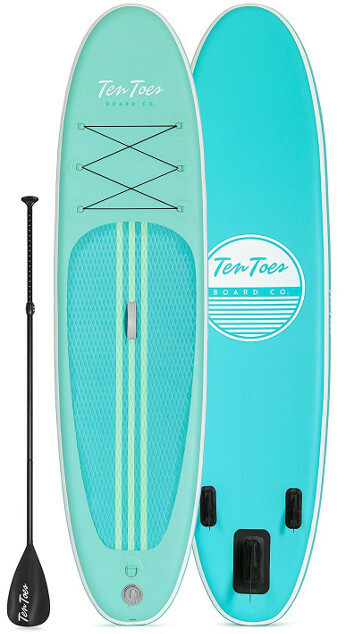 Accordingly, this is the sturdiest board from Ten Toes board emporium and one, which is versatile enough to make space for both yoga and family time. The best thing about the board at hand needs to be the design because it is the only thing, which truly sets it apart from the rest. Indeed, the yoga board at hand measures a humble 10 feet in length which is more than compatible with any teenage to adult woman out there. Nevertheless, the selling point of the Yoga board has got to be the 35 inches wide platform which is plenty for a balanced session of yoga, meditation or any type of body weight workout. Eventually, to seal the deal, the Ten Toes at hand kills the knot by a plentiful 6 inches in thickness that gives the board its rigidity and the paddler a maximum capacity of over 240 pounds. In terms of performance, you really cannot wish for more stability than what you’ll get from this Ten Toes, especially with this design. Truly, this board is stable enough to have a romantic dinner on top of it and that is made possible via the wide hull and triple fin navigation system, which is great for straight tracking. In the end, the Yoga Ten Toes is definitely a bargain for people who are truly into yoga and experiencing new environment because this board will allow you to do a lot more than you’d imagine. However, none would be possible without the proper equipment hence why the brand hooks this board up with a complete package that entails everything needed to maintain this board except for a much-needed bag. 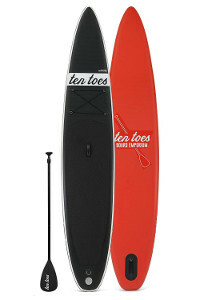 Ten Toes theJETSETTER is perhaps the largest inflatable paddle board on the market and certainly the biggest Ten Toes can come up with but there is a valid reason behind the humongous size of this thing. Indeed, the theJETSETTER is designed with a specific purpose and that is to be the fastest touring inflatable paddle board on water. The board at hand is splendid to say the least and that is what makes it great for touring. The theJETSETTER is actually a viable replacement of a kayak boat since you can use it both standing and sitting with the addition of a cloth removable seat. However, if you don’t feel like going through the trouble then this 14 feet long giant will keep any adult paddler in total and steady command. Also, to fortify the board’s stability, Ten Toes foes for the classic 30 inches in width in order to grant the paddler a stable platform. Lastly, a giant SUP board requires a lot of strength to remain as sturdy as necessary once inflated hence the 6 inches thick hull. Once compatible with the size of a board, your second and direct concern should be performance because it is what paddle boarding is all about. A good looking board that rides weakly is definitely not worthy of your money and that is something Ten Toes is very much aware of. Hence, the company made sure that the board at hand benefits from the cleanest finished edges, the tight nose and wider tail for balance and manoeuver and the single fin navigation for easier control. For a board this large, you’ll definitely need some sort of a bag to wrap it up which is the only thing missing in this Ten Toes packaging. Nonetheless, any other bag would do and if you can forgive them for that then you’ll have yourself a solid touring board which comes with every other essential accessory imaginable.